Acute lymphoblastic leukaemia (ALL) is a type of blood cancer. It starts from young white blood cells called lymphocytes in the bone marrow. The bone marrow is the soft inner part of the bones, where new blood cells are made. ALL usually develops quickly over days or weeks. It is the most common type of leukaemia to affect children but can also affect adults. Acute lymphoblastic leukaemia is rare. In 2015, around 830 people were diagnosed with ALL in the UK. ALL is most often diagnosed in children, teenagers and young adults. The age group with the highest incidence is young children aged 0 - 4 years. The word acute means that the leukaemia can develop quickly. This is because the lymphocytes are growing and dividing much quicker than usual. These abnormal cells build up in the blood. The leukaemia cells can build up in the lymph nodes, bone marrow and spleen and make them bigger. If it wasn't treated acute leukaemia would cause death within a few weeks or months. But treatments work well for most people with ALL. To understand how and why leukaemia affects you as it does, it helps to know how you make blood cells. Your body makes blood cells in the bone marrow. The bone marrow is the soft inner part of your bones. You make blood cells in a controlled way, as your body needs them. In acute lymphoblastic leukaemia, the bone marrow makes too many lymphocytes. 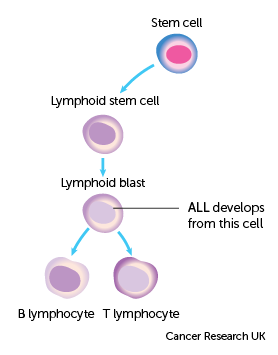 These lymphocytes are not fully developed and are not able to work normally. Doctors divide leukaemia into two main groups, acute and chronic. Acute leukaemia develops very quickly. Chronic leukaemia tends to develop slowly, usually over months or years without causing many symptoms. Doctors divide these groups further, depending on the type of white blood cell they affect. White blood cells help fight infection. But if your body makes abnormal white blood cells, they don’t work properly. So you are more likely to get infections and find it difficult to get rid of them. Too many white blood cells can overcrowd the bone marrow. So there isn't enough space for other types of blood cells. This can cause a lower than normal number of red blood cells and platelets. Having too few red blood cells makes you tired and breathless (anaemic). You can have bleeding problems such as nosebleeds, if you don’t have enough platelets. Abnormal white blood cells can build up in parts of the lymphatic system, such as the spleen and lymph nodes, making them bigger. They might build up in the liver. This can make your tummy (abdomen) swell and feel uncomfortable. The leukaemia cells can also spread to the brain, and the testicles in men.